Home Real Estate How has the Mauritian Rupee evolved over the past 10 years? How has the Mauritian Rupee evolved over the past 10 years? An investment professional's opinion on the evolution of the Mauritian Rupee for the past 10 years in relation to the Euro, US Dollar, South African Rand and Indian Rupee. In considering a possible investment in a foreign country, the international investor will invariably have to consider the implications of having an exposure to the currency of the investee country. The real return for a foreign investor will be impacted by changes in foreign exchange (FX) rates. While it is complex and debatably impossible to predict FX rates, it is nonetheless a necessary exercise to evaluate and to some extent quantify the potential risk exposure from movements in FX. The most common and usually more casual way to do this is to study the past. Studying the past does not make for a crystal ball, but it does make for wisdom. 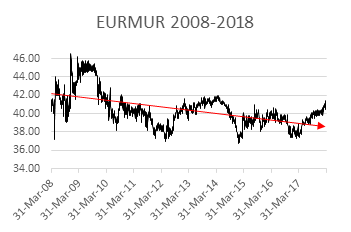 Below we will have a look at FX movements of the following pairs over the past 10 years (March 2008 to March 2018): EURMUR, USDMUR, ZARMUR and INRMUR. Assuming we all know what EUR, USD, ZAR, INR and MUR stand for, attention is drawn to MUR being the domestic currency. Intuitively, you may read the symbols as follows: EURMUR is the price of 1 EUR in MUR, USDMUR is the price of 1 USD in MUR, and so on. Therefore, if yesterday EURMUR was 37 and today EURMUR is 40, it means that yesterday it costed MUR37 to buy 1 EUR and today it costs MUR40 to buy 1 EUR. EUR today is more expensive and therefore EUR has appreciated compared to yesterday. Now, it does not suffice to observe a currency pair yesterday and today (time squeezed) and conclude that the foreign currency has appreciated or depreciated, though it is a starting point. There are several other ‘behavioural’ elements which should be studied. Caveat: Some say history repeats itself, but in financial analysis, past performance is not indicative of future results. This list is not exhaustive. We will however make do with it for the purpose of this article. Factors affecting FX rates are interest rates differentials, inflation differentials, current-account deficits or surpluses, public debt, terms of trade, economic performance and sovereign or political stability. In determining FX rates, the differences in these factors between countries which are relevant, not the levels or variability for one country alone. Interest rate or inflation rate in one country will not say much about that country’s currency when compared to a foreign currency unless a comparison of differences in factors is made between the two countries. Hence the use of the word ‘differential’. One thing to remember is that an FX rate is priced like any other commodity; in the case of FX, one currency is priced in terms of another currency. For example, 1 EUR costs X amount of MUR, 1 USD costs Y amount of MUR, and so on. We will go through these factors in a moment and it will all make sense. In the meantime, let’s tackle the fun part. EURUSD has slightly depreciated, if not remained constant, by 0.19% with a volatility of MUR1.83 around the mean, which is only 4.5% of that average value over that period. The highest value was 46.84 (on 17 December 2008) and the lowest value was 36.77 (23 January 2015). The trend has generally been down, to flat – indicated by the red arrow. USDMUR has appreciated, quite significantly in fact, by 28% with a volatility of MUR 2.60 around the mean, which is 8.2% of that average value over that period. The highest value was 36.70 (24 Mars 2015) and the lowest value was 24.10 (on 15 May 2008). The trend has generally been up. Side note: EURUSD is one of the majors, the pairs which are mostly traded around the world (85% actually). EURMUR and USDMUR are both derived from the EURUSD pair. ZARMUR has depreciated by 13% with a volatility of MUR0.62 around the mean, which is 19% of that average value over that period. The highest value was 4.65 (3 January 2011) and the lowest value was 2.13 (on 18 January 2016). The trend has generally been down. 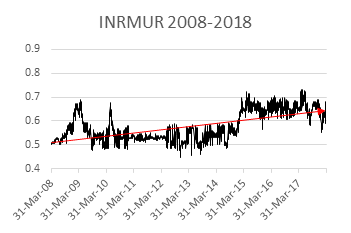 INRMUR has depreciated (actually the most out of the four pairs) by 21% with a volatility of MUR0.06 around the mean, which is 10.9% of that average value over that period. The highest value was 0.73 (27 May 2010) and the lowest value was 0.45 (28 August 2013). Now that we know what happened, we need to discuss why it happened. To do this, we need to first expand on the factors affecting FX rates; the building blocks to fundamental analysis. As a general rule, higher interest rates available in country A relative to interest rates in country B, will attract more capital to country A and will cause country A’s currency to appreciate. The currency of country A with a lower inflation rate will typically appreciate relative to a country B where inflation is higher. Lower inflation means less increases in prices. Less increases in prices mean higher purchasing power. So, if purchasing power improves in country A, the currency of country A will appreciate. However, increase in inflation is often countered by central banks with increases in interest rates, which may, as explained above, encourage foreign capital to flow into the domestic country (we did say that FX prediction was complex). The current-account is a record of the financial value of trades in goods and services of a country with the rest of the world. If country A runs a current-account deficit, it means that the country A imports more than it exports, which in turn means that it has to borrow foreign capital to fund the imports. Therefore, a country borrowing foreign currency will make its own domestic currency depreciate. Borrowing a currency implies buying that currency, in turn implying higher demand for that currency, making it appreciate. Easy. Countries with large public deficits are considered riskier by foreign investors. The more debt a country runs, the higher the risk of not being able to meet the debt repayments. If country A is considered riskier because of higher public debt, less foreign capital will flow to country A, as opposed to country B will lower levels of public debt. The terms of trade is the ratio of an index of a country’s export prices to an index of its import prices. Improved terms of trade indicate higher demand for a country’s exports, and therefore higher demand for that country’s currency. Again, buying a country’s currency will make that currency appreciate. A country demonstrating superior economic health and more political stability will attract more foreign currency – this is intuitive. Attracting foreign investment makes the domestic currency appreciate. Okay. Let’s now apply our understanding of these factors to the evolution of EURMUR, USDMUR, ZARMUR and INRMUR over the past 10 years. Since the 2007-2008 financial crisis, most central banks around the world abruptly shifted to an expansionary monetary policy, i.e. monetary policy intended to stimulate the economy, i.e. through cutting interest rates. This was also coupled with an unconventional policy called Quantitative Easing (QE) – buying securities in the open market to increase the money supply – beginning with the Federal Reserve (FED) in November 2008 followed by the European Central Bank (ECB) in May 2009. QE has the same effect as cutting interest rates and cutting interest rates generally causes a currency to depreciate, as explained above. Again, it is important to remember that in FX, it is interest rate differentials which matter. The above move (lowering interest rate) is what is called expansionary monetary policy. Think of it this way. The price of money is the level of interest rate. 10% p.a. on a loan is more expensive than 5% p.a. on a loan. If your bank reduces its interest on mortgage loans from 10% p.a. to 5% p.a., you are more likely to take out that loan. So, if interest rates generally are lowered, more people will opt for financing, and generally more financing stimulates the economy. After taking out a loan, you will buy or build a house, employ builders, renovators, plumbers, and so on. On 24 March 2008, the Monetary Policy Committee (MPC) of the Central Bank of Mauritius (BOM) cut the repo rate from 9.0% to 8.5%. Around the same period, the European Central Bank’s interest rate was at 4% and ending the year at 2.50%. The FED’s federal funds rate was then 3.5%, also ending the year significantly lower at 0.25%. The South African Reserve Bank’s (SARB) benchmark repo rate in 2008 closed the year at 11.50%, but the slashing began in early 2009. The Reserve Bank of India’s (RBI) benchmark interest rate came down from 9.9% late 2008 to 5% early 2009, went to a period of contractionary policy up until 2012 before easing one more. The world post-2008 was clearly in crisis and central banks around the world lowered interest rates in view of stimulating their respective economies. Today, the BOM repo rate is at 3.5%, ECB rate is at 0%, FED’s fund rate at 1.75%, SARB at 6.5% and RBI’s at 6%. Like the ECB on its last meeting on 8th March 2018 where the bank dropped its commitment to any increase in its QE program and reaffirmed its asset purchases at EUR30billion/month until September 2018 on the back of improving fundamentals, the MPC also provided a positive outlook on global growth, expects local economic recovery to be sustained and projected Mauritius GDP to grow by 4.0% in 2018. FED officials on their last meeting in March 2018 hinted to further rate hikes in 2019 and 2020 on the back of improved economic outlook. The SARB reflected similar sentiment on domestic growth outlook though acknowledging challenges, and focused on inflationary pressures, which according to the bank have somewhat subsided, affording a cut of 0.25%. The RBI in its latest meeting in April expressed expectations for an acceleration in economic activity from robust investment activity, supported by consumption demand and credit growth. Speaking broadly, the central banks of the countries under study here have presently shifted or have begun to shift to contractionary monetary policies (increase in interest rates), with the US clearly leading the way. Countries around the world, including Mauritius, experienced a drastic depreciation of their currencies against the USD when the FED began hinting its contractionary stance. 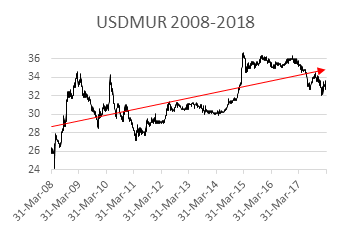 USDMUR appreciated 28% the last 10 years overall, but a closer look would indicate that USD appreciated steeply from 2014. One should also be made aware of the potential ‘weapon’ underlying the relationship between interest rates and FX rates. Depreciation of one’s currency makes one’s products and services cheaper to the rest of the world. Countries do engage in currency wars, depreciating their currencies to make their products and services more competitive in international markets. BOM intervenes regularly on foreign exchange markets, albeit to stabilize exchange rates against the MUR, but like other developing countries, one can interpret such interventions as attempts to depreciate MUR. With Mauritius’ Eurocentric tourism sector contributing approximately 8% of GDP (USD1.7bn in 2016) with roughly 40% of tourist arrivals from the Euro Area, maintaining a stable if not sustained EURMUR is surely advantageous for the Mauritian economy. It might not be surprising to find that EURMUR is the least volatile pair and if not range bound, among the four considered here. down-trending in the Euro Area (around 2% in 2008), in the US (around 2.5% in 2008), in South Africa (around 8% in 2008), in India (*wholesale price index around 10% in 2008) and Mauritius (around 6% in 2008-2009). Latest core inflation data today are as follows: in Europe 1.0%, US 2.1%, South Africa 4.1%, India 2.47% (*wholesale price index) and Mauritius 1.8%, and remain generally contained. Global inflation dropped significantly since the financial crisis, which is understandable. A cooling economy comes with lowered inflation. However, despite sustained improvement in global macro metrics today, global inflation has remained subdued – a conundrum. Should we expand on this, it might take another paper. Let’s devise another pragmatic way to look at inflation pressures: when interest rates are lowered, the economy is stimulated. More people take financing and do business. That, we covered. Now, with more money in circulation, general demand for products and services also increases. People want/need to buy more. By buying more products and services, prices of these products and services increase. This… is inflation, demand-pull inflation to be precise. We can also experience another type of inflation called supply-push inflation when supply decreases while demand remains constant. The Euro area has been running a consistent surplus since 2013, with the most recent figure of EUR12.8 billion in January 2018 (monthly figure). Mauritius has been running a deficit over the past 10 years, with the latest figure of MUR10,649 billion (quarterly figure) in the fourth quarter of 2017. As for the United States, they are notorious for having run a current account deficit since the early 1990s, reaching a low of USD215.8 billion in 2006. However, the demand for US investments (US Treasuries) has sustained/is sustaining this deficit, for now. South Africa is also a current account deficit country and has been for the period under study with a recent figure of ZAR137.5 billion in the fourth quarter 2017. India has run a current account deficit since 2009, with the latest figure of INR887.5 billion in the third quarter of 2017. Among the five economies studied here, only the Euro area is presently running a current account surplus – EUR in favour. Like in the Euro area, Mauritius’ public debt surged in 2009. In 2008, public debt in the Euro area was 68.6% of GDP, while public debt in Mauritius was 48.6% of GDP. In 2016, Euro Area public debt was 88.9%. The recent 2017 figure for Mauritius was 64.9%. While this is a high figure, Mauritius’ public debt as a percentage of GDP is significantly lower than that of the Euro area (though that’s an overly simplistic comparison and no actual meaningful conclusion can be drawn from this). US government debt has followed a sustained uptrend over the past 10 years, reaching USD21,089 billion in March 2018, which is roughly 105.40% of GBP (latest figure). Basically, the US owe more than they can produce in a year, having crossed the 100% line in 2012. India government debt to GDP has significantly decreased from 74.5% in 2008 to 68.7% in 2016. India’s GDP in 2016 was USD 2.264 trillion (for info, about 186 times that of Mauritius). As for South Africa, we can notice a gradual year-on-year increase in public debt to GDP since 2008, from 27.8% in 2008 to 53.1% in 2017. South Africa’s 2016 GDP was USD294.8 billion. Basically, among these economies here involved, South Africa’s public debt to GDP ranks first followed by Mauritius. For simplicity, we observe Germany and France’s terms of trade. Germany and France’s terms of trade have generally improved since 2008, with the latest figures at 104.11 and 114.64 respectively. Mauritius has also witnessed improved terms of trade over this period, with the latest figure at 108.60, though a notable decrease since 2016. This could have been driven by heightened competition from other Sub Saharan countries in the manufacturing sector – a mere speculation and a separate topic to be delved into. US terms of trade have improved since 2008, stabilized around the 100 mark since 2015, though the latest quarterly figure 2017 returned a decrease to 99.85. As for India, we see a significant mark-down to 71.8 from 79 in 2008 ((though improved from 2015 figure of 57.9). We did not compute terms of trade for South Africa. Like most countries post 2008 financial crisis, the Euro area, the US, South Africa, India and Mauritius have shown significant slowdown in GDP growth. The Euro area moved into negative territory in 2008 and recovered in 2009. Mauritius came close to negative in 2009, but generally maintained growth, albeit at a modest pace. Over the past two years, Mauritius GDP growth has flattened around the 4% figure. Estimation for 2018 is set at 4.0%. The US began to recover in 2009, though improvement in unemployment rate only begun to be reported late 2010, hence the prolonged expansionary monetary policy. The latest 2017 figure is reported at 2.9%. South Africa went to several crises since 2008, when the economy shrunk by 6%. Only recently economic growth picked up, reporting a latest figure of 3.1% in 2017. ZAR is a commodity currency, meaning the currency’s path is sensitive to movements in commodity prices because a significant part of South Africa’s economy is concerned with commodities. 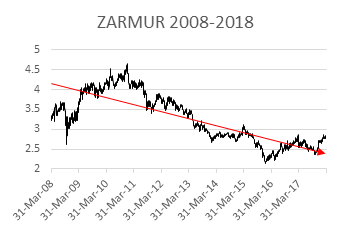 As a result of the commodity price shock of the 2nd half of 2014 (coupled with political uncertainties not elaborated on here), ZARMUR was axed until reaching a low of 2.13 in January 2016. India has recently reported a 7.2% figure for 2017 and is poised, according to the RBI, to sustain this growth. On the sovereign stability front, we can be offered an idea by looking at the Political Stability Index published by the World Bank. In 2008, Mauritius was ranked 41st. In 2016, Mauritius moved up to 19. Germany, France, Italy and Greece in 2008 were 36th, 64th, 65th and 84th respectively and in 2016… were 54th, 104th, 76th and 109th respectively. We may conclude a general deterioration in political stability in the Euro area, with periods of unrest, fear and a general environment of political uncertainty (not to say far-right attraction). USA was ranked 61st, India 166th and South Africa 100th in 2008. In 2016, the three countries, in this order, were ranked 77th, 166th and 108th. Worse off for USA and South Africa, and no change for India. If in 2008 you decided to host a rat race with four rats named EUR, USD, ZAR and INR, who were all MUR in nature, 10 years later in 2018, INR would have won, followed by ZAR, followed by EUR with USD well behind, actually having run in the opposite direction (another pragmatic way of looking at things). FX rates are, once again, complex and debatably impossible to predict. As an investor, as opposed to a speculator, indulging in prudence means not to unduly expose oneself to FX fluctuations. Presently, certain commercial banks in Mauritius offer accessible tools to mitigate exchange rate risks, such as forward contracts. They come at a cost but a cost which is defined. Another way to manage FX exposure is to diversify. As an international investor, you could analyse the merits of investing in MUR based on the factors elaborated on above, coupled with other analyses (technical analysis for example). But say you were to repatriate your funds in USD at the end of your investment horizon, you would be wise to consider this particular MUR investment as a component of a larger investment strategy which involves other currencies. The starting point of all eventual consolidation is to determine your home currency – the currency in which you spend – the currency in which you define your wealth – since this currency will determine whether you are a gainer or a loser. Having lived through controlled damages from the systemic ripples of the 2007-2008 financial crisis, prudent yet controlled expansionary monetary policy/ies, relatively sustained foreign investments, an improved political perception of Mauritius, inflation rates somewhat in line (except in times of supply shocks), MUR as a currency has been fundamentally positive, except for a deteriorating current-account deficit and increased public debt to GDP. Mauritius as an investee destination continues to offer interesting investment opportunities or a platform to operate from or branch out. Going forward though, the management of public debt, relative to GDP, could certainly use some intelligible focus – for not going apocalyptic. Specialised sectors, both for diversification and to boost exports, should perhaps be encouraged, while not forgetting our ecological heritage – perhaps the subject of another paper. Some surveyed would then probably place MUR as overvalued on account of a deteriorating current-account deficit and public debt to GDP. Some others would differ on account of sustained foreign investments, reasonable GDP growth and positive outlook compared to some parts of the world. The most important conclusion? Protect yourself against ALL unnecessary risks by contacting your wealth manager. Should you require additional information, you can contact me. Adil Aboobakar, a CFA Charterholder and an investment professional with close to 9 years of experience in the financial services sector, believes continuous education is key to real progress. Adil is presently a client manager with a Family Office and has been accompanying family entrepreneurs to diversify part of their wealth in the region. 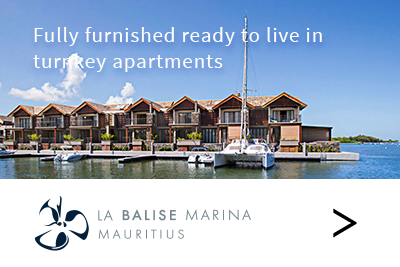 He has been encouraging the promotion of Mauritius as not only the generic International Financial Center, but as an investee destination with depth of history, lifestyle advantages and quality people with serious ambitions.